First, let me say how honored I am to be nominated again as a Liebster blog (my second nomination). This time I was nominated by Alicia at The Better Nester. Thank you Alicia! You can see the blogs I nominated for the Liebster blog here. I've been n the middle of preparing items for a local consignment sale. 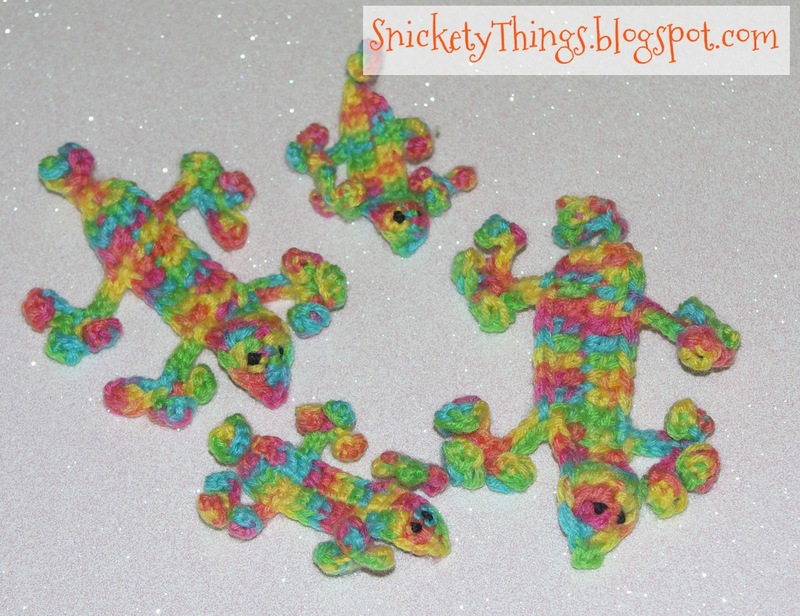 In the middle of the chaos I got a request to make some rainbow lizard barrettes for a friend's daughter. Her fifth birthday is coming up and her theme is lizards and the party colors were bright green, blue, pink and orange. I found the perfect yarn at Hobby Lobby and went to work. I stayed up late every night for a few days making sure I would have the lizards ready. Even though we haven't had any sun for a few days (meaning dark pictures) I snapped a few pictures. She wanted four lizards total, two larger and two smaller. A set for her daughter and a set for her daughter's doll. I took the pictures before I sewed them to the barrettes. 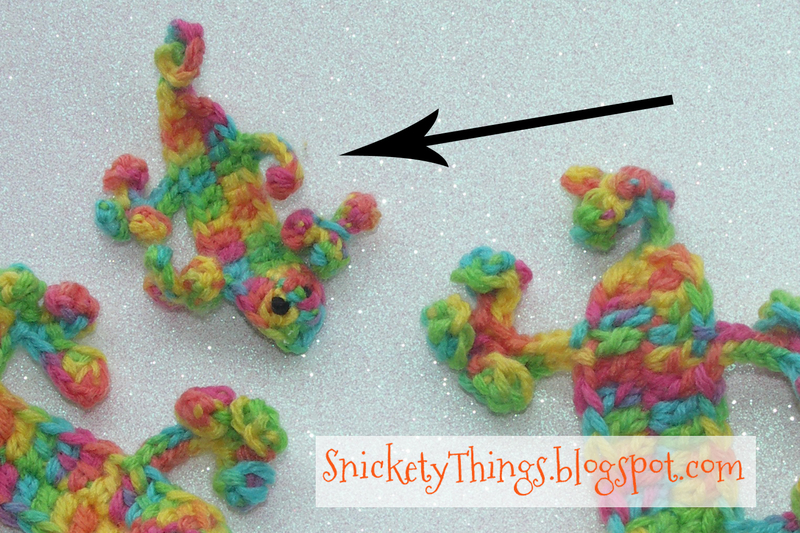 When I went to sew the last small lizard on, I noticed something. Do you see it? Let me help. See that arrow? Somehow I managed to only give this poor lizard one little toe instead of three like the other feet. Lets just say I had to make another small lizard. This lizard is based on the Lion Brand bookmark, but I did them in one piece instead of each limb separately and a much shorter tail. Hi, just found your blog through The Grant Life's blog hop. what a treat to come across your sweet lizards! They reminded me of the little critters we used to see running around when we lived in Hawaii. I am sure you made the kids so happy at the birthday party! Thank you! I remember a few of those lizards in Hawaii when I visited. They were cute. Super cute! I love the rainbow color! those are soo cute! I wish I could crochet that well. These came out fabulous. You are so good for making a new one. I defnitely would have come up with some kind of story about how he only needed one toe because he was magical or something of that nature. Thanks so much for sharing at Whimsy Wednesdays. Thank you! I really had to make another, she was paying me for them. I didn't want to give her something sub-par. besides, I'm a perfectionist when it comes to that kind of stuff. Those are the cutest lizards I've ever seen. How fun to wear then on a barrette. Bet the little girls will love them. Those are too cute! Thanks for sharing the Lion Brand pattern. Much appreciated! Thank! We don't have a pet lizard either, but my daughter would love to have one, or a turtle. These are SOOOO cute!! The yarn color is so pretty! :-) You did a great job! Thanks for sharing! I'm a new blog follower and look forward to seeing more posts! Thank you! I'm making some stuff for my daughter now. I'll be posting it soon. Thank you! I will drop by.